Getting tired of carrying and paying expensive airways fees for your equipment? Then, this is the perfect kitesurf camp for you! 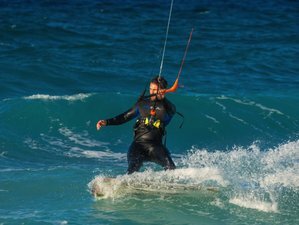 You don't have to worry about your equipment because WetSkillz kite center offers a possibility to rent kite equipment for independent riders who have upwind riding experience to enjoy kitesurfing in Rhodes. Located in one of the best kitesurfing spots in Europe, WetSkillz kite center will make sure that you get an unforgettable experience! During this kitesurf camp, you will be accommodated at WetSkillz kite center beachfront guesthouse. The guest house is right next to the station, 50 meters from the water, and offers spacious apartments equipped with a small kitchen, television, air conditioning, Wi-Fi, private bathroom, and balcony. There is also a lounge area where you can relax while your partners are riding, have a drink from the bar, or even taste the homemade Greek dishes. This kitesurf camp will take place at Tholaros Beach, Rhodes Island. This island is one of the best kitesurfing destinations in Europe. The near constant wind, warm and safe waters, beautiful beaches and amazing climate of this island have made it famous for wind and water sports. It means that this is the ideal place to learn how to kitesurf. There are more than 2 kilometers of uncrowded coastline to ride. The constant and reliable winds defined Theologos Beach as the best kite spot in Rhodes. The kite station and guesthouse share the same area where the waters and Meltemi winds await you just outside your front door at Tholaros Beach. It is located just 5 minutes (5 kilometers) away from the airport on the west coast of the island and also 20 minutes (20 kilometers) from Rhodes town. This location is out of the tourist area, really quiet but still near the shops, supermarkets and some nightlife in Theologos village which is just a 10-minute walking distance. It is easy to reach by bus, taxi and also by the transfer service. The guesthouse has a restaurant that is open all day with several snacks in the daytime. Later in the afternoon, they serve more platters. There will also be 1 Greek barbecue night which is free of charge. You can always have a great traditional Greek meal, cooked by Mrs Katholiki. Everything is fresh and delicious! The option of full board is also available at an extra cost. Please book your flight to arrive at Rhodes International Airport (RHO). Transfer from the airport is included. WetSkillz kite center will pick you up from the airport. You can reach WetSkillz kite center easily by using the bus line from Rhodes to Theologos village. You can hire a taxi with an estimated cost of 25 EUR from the center of Rhodes town.